A powerful new instrument called NIRPS (Near Infra Red Planet Searcher) is to be installed on the ESO 3.6-metre telescope at the La Silla Observatory in Chile. Built by an international collaboration  co-led by the Observatoire du Mont-Mégantic (OMM) team at the Université de Montréal and the Astronomy Department team at the Université de Genève, NIRPS is a high accuracy radial velocity infrared spectrograph designed to detect Earth-like rocky planets around the coolest stars. The formal agreement to add NIRPS to the suite of instruments on ESO telescopes was signed by Tim de Zeeuw, ESO’s Director General, Marie-Josée Hébert, Vice-rector for Research, Discovery, Creation and Innovation at the Université de Montréal and Michel Oris, Vice-rector at the Université de Genève. NIRPS will complement the HARPS (High Accuracy Radial velocity Planet Searcher) instrument currently attached to the ESO 3.6-metre telescope at the La Silla Observatory in Chile. HARPS is the world’s most productive planet-hunting instrument using the radial velocity method, and it has revolutionised our understanding of exoplanetary systems. NIRPS will become the “red arm” of HARPS, extending the telescope’s capability into the infrared and allowing astronomers to characterise planetary systems. ESO will allocate 725 observing nights over a five-year period to the NIRPS team. The main goal of NIRPS is to use the radial velocity method to detect and characterise planets orbiting cool, red, low-mass M-type stars. In particular, NIRPS aims to find Earth-like rocky planets that could potentially be habitable. M-type stars are of particular interest because the radial velocity variations induced by an orbiting planet are larger for a less-massive star than a Sun-like star, and hence their planets — including those in the habitable zone — are more easily detected. NIRPS will operate in the infrared as this is the main range of wavelengths emitted by such small, cool stars. For red stars, which are the most common kind in the solar neighbourhood, NIRPS is expected to produce data that are at least as accurate as currently available with the HARPS instrument. NIRPS is expected to see first light in the last quarter of 2019. The collaboration consists of: OMM and the Institute for Research on Exoplanets (iREx)at the Université de Montréal in Canada; the Astronomy Department at the Université de Genève in Switzerland; the Université de Grenoble-Alpes in France; the Instituto de Astrofísica de Canarias in Spain; the NRC Herzberg Astronomy and Astrophysics in Victoria, Canada; the Instituto de Astrofísica e Ciências do Espaço, Univ. of Porto and Lisbon in Portugal; the Instituto Mauá de Tecnologia in Brazil; and the Universidade Federal do Rio Grande do Norte in Brazil. The first phase of the NIRPS project will involve the installation of a new Cassegrain adapter to replace the one currently on the ESO 3.6-metre telescope. This new unit will include adaptive optics capability and will be commissioned using the HARPS spectrograph. 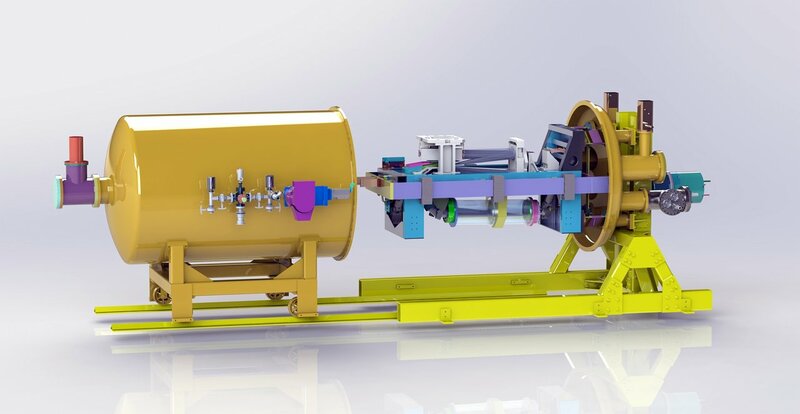 Meanwhile the NIRPS instrument will be assembled and tested in Canada, following which it will be integrated with the new Cassegrain adapter on the telescope.